Day 21: Arrived on land! 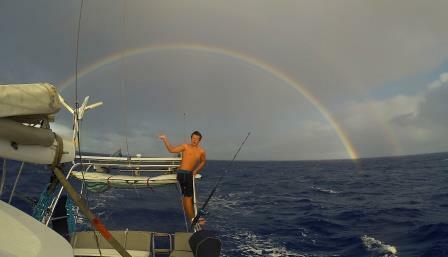 Today at about 3:00pm we arrived at Honokohau Harbor on the west side of the Big Island, Hawaii. Our day sail from the anchorage 36 miles north was sweet and lovely. Beautiful sky and seas, with enough wind to sail much of the way. Watching the landscape of this beautiful volcanic island unroll to our east made me want to get on land, to see the green fields and climb the mountains. Now I am tucked into my dear friend Johanna's home halfway up Mauna Loa in the middle of Parker Ranch. The view from up here shows me the very water we sailed across today. I am so happy to be here with an old friend and her family. And I am so happy that I was able to share this time with the Nie's aboard their sailboat, to help them come closer to fulfilling their dreams and the mission that is so important to them. The companionship and love that grew between us was palpable and permanent by the end. So now, on solid ground and so far not swaying too badly, I say goodnight and end my blogging for a little while. For the next few days Carmen and I will get our land legs, swim a little and catch up with old friends. Then we will board a plane for Alaska and reunite with our boys. her bed while breakfast cooked. After an hour or so, she emerged with a tiny scroll of paper, tied with ribbon. She placed this message, plus a pencil, inside the empty wine bottle we had saved for this momentous occasion. We wanted to sing some sort of shanty or other commemorative song to wish the small glass vessel a fair voyage. Unable to come up with any such appropriate song, we lined the rail while she prepared to fling the bottle overboard. We hope that this little vessel has as much fun as we did on our journey, travels far and wide, and we hope that one day someone finds it and emails us! fast ride to our anchorage, a roadstead spot on the northwest shore of the island. We circled the anchorage and then let loose the anchor, relishing in the thump thump sound of chain rushing out of its holder in the bow. And then. We. Stopped. For the first time in 20 days, we ceased moving forward. 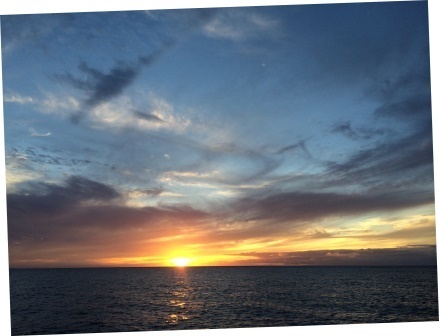 We now gently sway at anchor, celebrating our accomplishment, making popcorn for dinner and taking photos of this spectacular sunset that Hawaii is painting in the sky for us. We are satisfied. Relieved. Satiated. Overwhelmed. Happy. Filled up. Released. Thankful. Appreciative. Silly. Smiling and breathing deeply, we laugh and settle in. 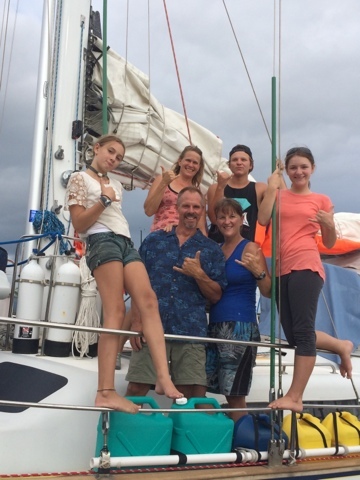 Being at anchor provides a needed transition between our nomadic lifestyle and one on land. Still bobbing on the sea, but anchored securely to land, we adjust and relish in life. 2,786 nm away from Mexico, 36 nm to our final destination in Kona, Hawaii. This e-mail was delivered via satellite phone using GMN's XGate software. generator and the unmistakable whirr of a fishing pole with a Fish On! These will always bring a smile to my face. Harbor, near Kona on the Big Island of Hawaii. 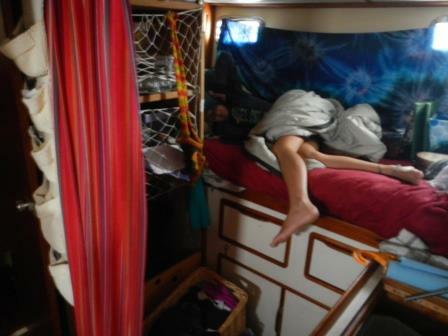 sharing kitchen duties, and maintaining the good ship S/V Sweet Dreams. all comfortable spending time together and also taking some time alone. our paths will meet again. awesome and I will never tire of looking at it. -	A pressure cooker is my new best friend in the kitchen. dose of love thrown in. STILL go by in the blink of an eye. wants to wear to school. -	At 48 years old, I am still learning. Still discovering who I am. trying to be something else. From 2,486 nautical miles offshore from Mexico, 331 nm to get to Hawaii. I have my yellow earplugs in, and then I put another pillow on top. they are a lost cause. Literally. best friend who's close to being a sister. eat, so we quickly released them. Two we kept for dinner. 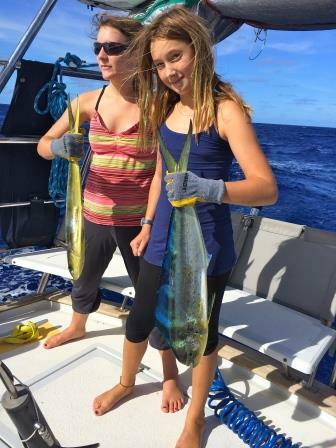 common name is Mahi Mahi) are the most beautiful fish I have ever seen. watch and, I think, worth noting. 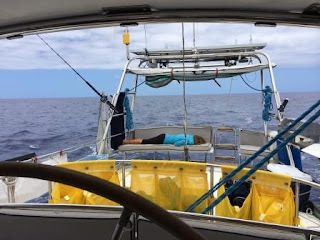 most of us reading or just resting, when we heard the call – "Fish On!!" this kind of hunting and gathering and teamwork. result, a flatter boat led to a sweet yoga practice. upwind and heeled over so much that Down Dog was out of the question. other and a sort of do-see-do occurs. steady wind pushes us westward. and breathed and found my namaste. Ahhhhh, bliss. ~2,050 nautical miles offshore, another 770 to go until landfall. no surprises, a following breeze and gentle seas. reading and taking naps. Well this perception is far from the truth. demands that we be constantly on our toes. 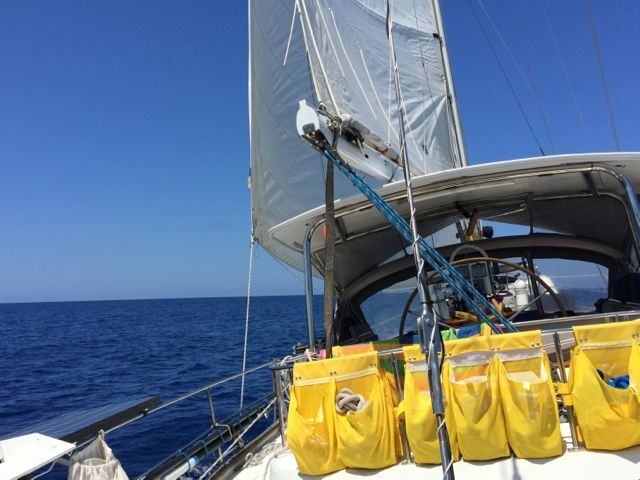 few hours later we doused the genoa and flew the asymmetrical spinnaker. 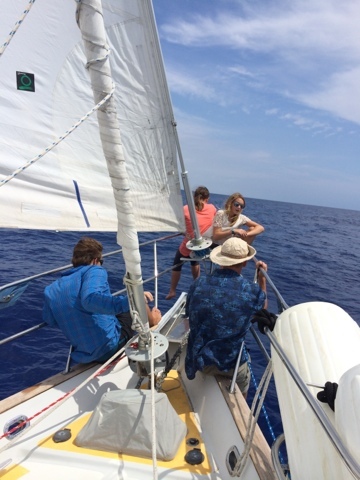 torn sail gloves and weary crew who forgot to stop and eat lunch. teamwork, strength, and comraderie. Because we feel closer to nature. lives in front of them. From 1,913 nautical miles off shore, 904 more to go. simple pleasures like finishing a book or re-rigging the fishing poles. been? Who lost it overboard? Where did it start? Where will it end up? ~1,764 nautical miles off shore; 1,107 more to go. a sail up the bay. One of the things we do a lot of there is sleep. their allowing me to indulge in as much of day off as we can have here. Half-way mark Passed! 1,450 nautical miles offshore, 1,366 to go. spotted us behind them and we had a 15-minute conversation with them. doing the same thing we are doing (albeit with a different destination). tonight when the swell subsides. that we make the change. no change was needed. Patience. 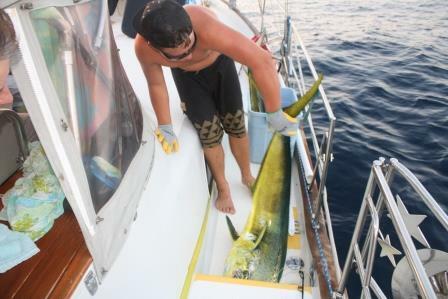 lost two lures to 5-foot+ long marlin and caught a dorado yesterday. I have ever felt before. Not in a bad way, just in a humbling sort of way. flying fish are our only companions. personality, is moody and serene, beautiful and ugly. It is constant. It is blue. So blue. Indescribably blue. 15 knots of wind with swell from the Northeast." just a guess by NOAA – remember you are out there now and it is what it is." And it is indeed a gigantic blue ocean. And we are in the middle of it. there receive a more accurate prediction. times, but overall an enjoyable sled ride. Last night was not so nice. enjoyed naps during the day and hope for a smoother night tonight. jib as the evening and the gustier winds fill in. 1,177 nautical miles down, 1,657 to go! perfect not-too-strong winds that are on the back quarter of the boat. way) as this more billowy sail catches the wind and pulls us forward. sail and smooth fast sailing result in happy people and a happy boat. joy in my daughter who is on the brink of becoming a teen. 987 nautical miles down, 1,830 to go! Enjoying the ride. aroma of cooking cinnamon rolls – YUMMMM. thanks to the excellent training she received from her dad. for dinner, my how the day flies. the boat makes is amplified in the quiet windless night. and who knew we would go 700 miles until we needed to run the engine!). we could sail all the way to the harbor and get towed in. No big deal! 760 nautical miles down, 2,063 to go. friends as they travel through dark water. no damage, just a little bit of heeling over and adrenaline rushing. Right now, at about 4:00pm, those strong winds are beginning to build. of sailing without the engine. find the website url and have to send this now). consistently milder than we expected. Better safe than sorry! Another important duty aboard the boat is to take a shift "on watch." daytime shift so that I could hand-wash our clothes on the back deck. some much-needed breaks or time to do other things. One of the other things we did today included catching a 6-foot marlin. helps us get in our groove. brought us beautiful wind and seas, clear skies and comfortable temps. West, toward our destination of Hilo, Hawaii. making our own green energy with six solar panels and a wind generator. moving along the gently rolling swells of this big beautiful blue sea. how to describe it - deeper than sky blue and with a magical brilliance. themselves are actually rolling underneath you. weather routing service and to Bruce to get the go-ahead, and we are off! in the Mexican summer heat. Life is good. are floating on a giant blue disk." engine rumbling below us, no uncomfortable waves tossing us around. trip from Mexico to the South Pacific. We are hoping to follow suit. serving me well, as we go in a seemingly roundabout way to our destination. Okay, I get it now. Over the past two years I have known many people on sailboats who cross the Pacific Ocean. I have wondered why it takes them sooooo long to get off the dock. I have watched these friends set a departure date and delay and delay and delay again. They change out parts, paint, fix things, provision and end up provisioning a second time because they are so late getting off the dock they have eaten all of the food they carefully selected for the first departure date. My logical self knows that they were being cautious and careful, but I have to say that before this experience, I did wonder whether they were possibly overdoing it, or putting it off because it is simply a scary prospect, crossing the huge ocean in a small sailing vessel. Now, almost seven weeks since Carmen and I left Anchorage, Alaska to climb aboard S/V Sweet Dreams and crew for them across the Pacific, we are still at the dock and I finally understand. With my tail between my legs, I admit that I was clueless. All six of us have been pulling our hair out working to get the boat ready and waiting for the weather. Everything takes longer than anticipated. The weather is unpredictable. Thus, we have missed many deadlines while we do this Departure Dance that I imagine all seamen become accustomed to. A few rules of thumb: respect the ocean, wait for a good weather window, don't rush. Have another margherita and wait. While we wait for the perfect weather window, the girls and I took a few hours off to play near the surf. The first deadline we missed, our launching date of May 9th, was due to issues with the work being done on the boat in the boatyard, to the tune of nearly three weeks worth of delays and missed deadlines for launching. Our actual "splash" was May 30th. Honestly, it's a good thing that we were delayed, because Gina and I worked nonstop during those weeks sewing canvas covers for the inflatable dinghy (called "dinghy chaps"). Our estimate that it would take one week to complete was way off when attempted by novice seamstresses such as ourselves. During this first three-week delay, we missed our weather window to go to the South Pacific. Either too much wind in the form of cyclones or monsoons, or not enough wind in the doldrums make it not a good choice this time of year. And so we changed our destination to Hawaii. 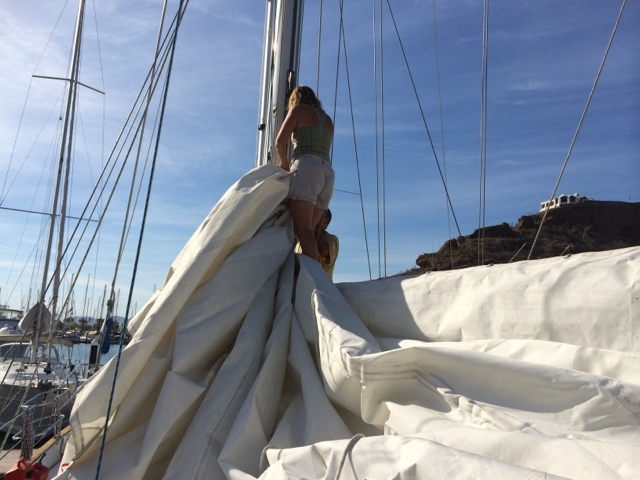 Once in the water, we remained on the dock another three days rigging sails, making more last-minute repairs, shopping for food, and waiting for a good weather window to safely cross the Sea of Cortez. 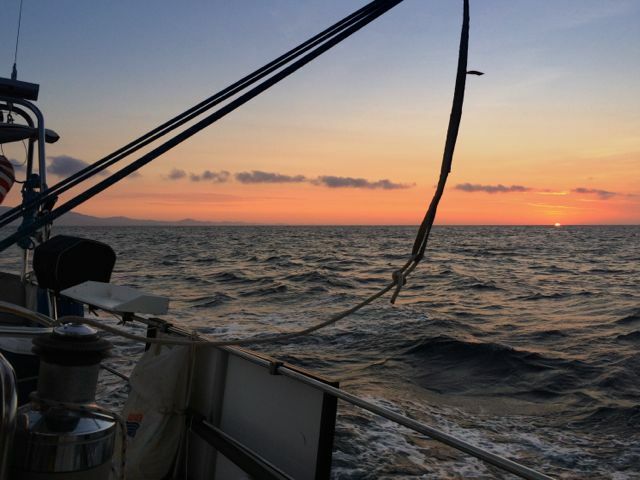 After successfully crossing the Sea on June 1-2nd, we spent the next week hopping south in beautiful aqua water and monitoring Hurricane Cristina, slowing down since we knew we had to wait for this storm to peter out before we rounded the tip of the Baja Peninsula and headed West. 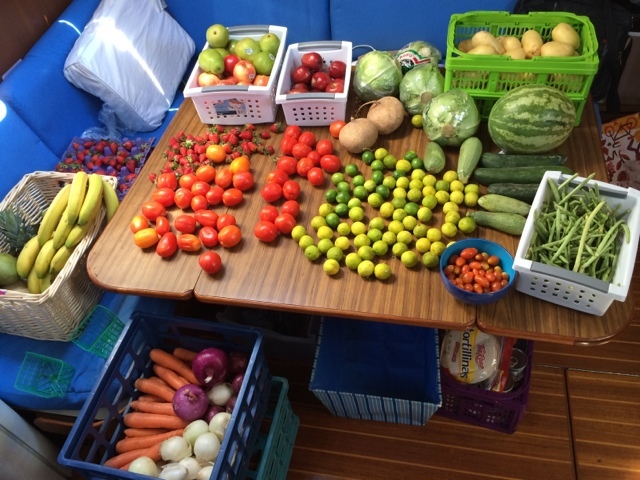 Eating the food we carefully provisioned to last four weeks for six people at sea. Accepting the weather delay with a sigh and a feeling of gratitude for modern meteorology and technology, making us delayed but helping us avoid catastrophe. So, we monitor the weather and meanwhile tidy up and dance a little. We get to those last-minute items on the to do list that we thought we might just never complete. We hold safety meetings and prepare to stow everything once again. We learn patience. 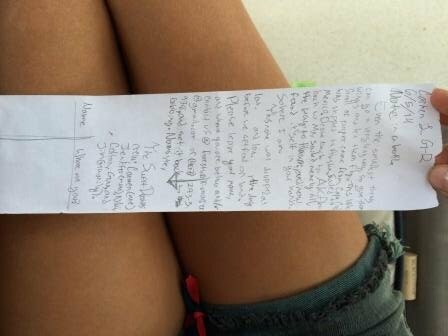 Reviewing where medical supplies are and how to use them.....yes, we are VERY prepared aboard S/V Sweet Dreams! For days the hurricane (upgraded from tropical storm two days ago) has been growing in strength and tracking NW, right toward our route to Hawaii. But today, things are looking better, the storm is expected to dissipate over the next few days. This morning we got that green light from Brynn for a tentative departure of Monday or Tuesday. Not only is it looking likely that we can avoid getting caught up in it, but we will actually benefit by receiving some decent wind for the first part of our journey, left over from the hurricane's power. Even so, the latest departure date of "Monday or Tuesday" remains tentative. Mother Nature is fickle and unpredictible. Taking a break from boat stuff - a blustery walk along the beach. Terra firma for a few more days, then only ocean under our feet. P.S. You might be wondering how in the heck we monitor the weather without the Weather Channel. Here's how it works: When we have an internet connection, we watch the storm via NOAA and other weather websites specifically designed for sailors. We also have Bruce (my husband) back home in Alaska sending us emails with his merchant marine sailor's interpretation. 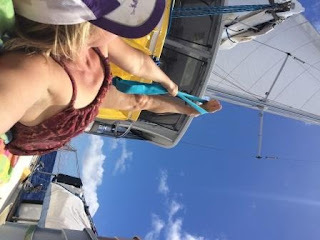 When we are not land-based and thus have no wifi, we email or call via satellite phone, and get updates from Brynn, our official professional weather router who is the person in the end who decides when we get a green light to depart this hot dock. 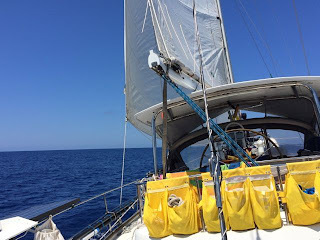 While underway we will use a low band-width dialup email connected via satellite phone. Once a day we will upload and download emails - this way Bruce will send us updates. When needed, we will call Brynn via sat phone. Niki and I had just let go a juvenile pufferfish that Colton had caught for us, and were sitting on the bow, laughing over someone's slip of the toung. 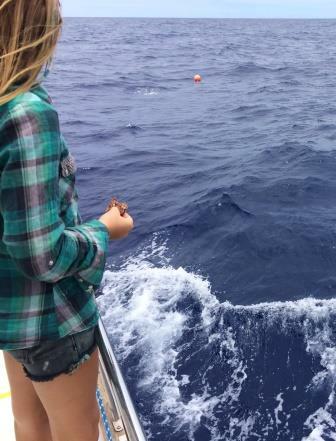 It was getting on to evening, and the swells were dieing down, so we started to make our way back to the coc pit, but Niki spotted something on the top of the water. "Man of war!!" I said. I had read a book on sealife and knew that the Japanise man of war was (as I put it) really poisonous!! "Well, then, what are you waiting for? Get the net!!" I ran to the long-handled net (there was no way I was touching this thing), and jumped into the water. "Colton, where is it?" I asked, as he was leaning over the rail, looking down at it, and I couldn't see it from the water. He pointed in front, and to my right a little. "And which way are the tenticials pointing?" He pointed his finger away from the hull of the boat. I swooped my net in the direction he had indicated. I swam in a way that the net was far from me, but the jelly couldn't get out. As soon as I got to the ladder, I handed the net to Niki. We turned the net up-side-down and shook it a little over a bucket. The jellyfish stuck. We shook it a little harder. The jelly still stuck. "Pesky lil' booger aren't you?" Niki mumbled. I reached over and grabbed the smaller, wooden handled net. I poked at the jelly with the end of the wooden handle until lit let go. "There." I smiled. As I was putting it down, the end of the wooden handle brushed my leg. I was so caught up in the moment, ooing and awing at the jellyfish, that I barely noticed. What I did notice though, was a small irritation on my right thigh. Then the irritation became a bother, then a hazard. "Ah ah oh ooow. I got a sting. I got a sting." I started hollering. "I don't know, probably that!!" I pointed toward the little white bucket. "Aah! It hurts!!" At that moment three things happened. While Gina started to prepare some baking soda paste, my mom pored some fresh water on it in an attempt to clense the salty leg. Wrong move. Fresh water on a jellyfish sting releases the toxins and is one of the worst things you can do to it. Almoste immidiatly, the joint on my leg started to cramp up. "My leg feels weird." I said in a small, scared voice. "Her leg feels weird," my mom yelled down to Gina, "please hurry!!" About a minute later, Gina came up with the backing soda paste and started slathering it on. "It's not working." I wined, "it hurts!" Gina started flipping through medicinal books while my mom applied more of the paste. "Just breathe honey, it'll be alright." "It HURTS!" Tears sprung to my eyes. "I need a doctor, please! Help me!" My hands started to clench. My lungs didn't want to breathe, and my eyes wanted to close. "Please. Help me." I said in a thin voice. Jim was standing over me. Just breathe, Carmen. Keep your eyes open. Look at me. "I need a doctor." I started clenching and spreading out my hands. 'In, out, in, out' I told myself that's all that matters. Just breathe. In, out, in, out. I'm going to be okay. But I didn't believe myself. "I got stung." Was all I could say. "Ooh them man of wars are mostly harmless, but they do hurt, don't they?" The man said. "What did you do first?" Jim told them that at first they had poured fresh water, then baking soda paste, and when that didn't work, alcohol and vinegar. "First off, the fresh water releases the toxins..." And then he went down the list of mistakes that we made before vinegar. Meanwhile, I was still relieved at not being in serious threat, as I was stung by a Portuguese man of war, not a Japanise man of war. Later my mom swam in. When I walked toward the board, my knees felt so week that they might just collapse. Mom paddled me in, and, since it was rolly, she suggested that I swam the last ten feet. "No." I said. "I'm not swimming today... or here... or untill we're at least two hundred miles out at sea." We laughed a little and I shakily climbed aboard and collapsed into my bed. 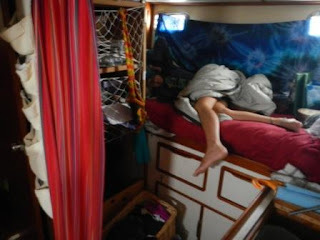 We moved aboard S/V Sweet Dreams four days ago and sailed across the Sea of Cortez. 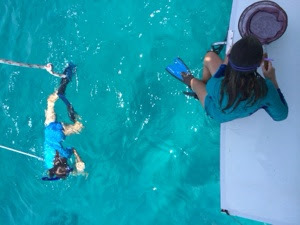 We have been anchoring in pristine aqua-water coves as we make our way down the Baja coast toward Cabo, from where we will launch out into the Pacific Ocean. It feels good to be off of dirt and rock and instead to roll on ocean water. (Well, the rolling didn't feel so good the other night when it was big and mixed up and making me puke). Even so, it feels good to finally GO! The last five weeks have been full of accomplishments and setbacks. Two steps forward one step back, as we prepare to depart for a sailing journey across the Pacific Ocean. A sailboat is complicated, with electronic systems, plumbing systems, sailing systems, engines, and mechanical and structural issues. And when it is going to be your home and your means of transportation for weeks on end in the ocean, making sure that all systems are more than OK is critical. Thus, the to do list grows and grows and needs to be thoroughly completed. Not any time for sleeping or relaxing. Preparing for something like this makes the actual journey itself feel like the reward, the easy part. The "work" involved once actually sailing involves taking shifts at the helm through the night, checking engine systems, changing sails, cooking for the crew, tracking the weather and plotting our course. It may mean lots of time to read and nap. Stargazing and sunrise/sunset and wildlife viewing. I don't mean to sugar-coat it, for it may also mean days on end of weathering a storm and not sleeping much but even a storm will eventually come to an end. After weeks of preparation, this ocean-bound lifestyle feels simple and refreshing compared to the massive amounts of planning, organizing, preparing, hauling, tweaking, fixing, installing, painting, sweating and tearing that have comprised the weeks leading up to departure. So for now we relax, knock off a few more to do items, and wait for the perfect weather window to cross. It is hard to believe that it's been five weeks of preparations to depart Mexico. Tomorrow we will finally leave! Bottom painted, groceries (for 6 people for 3-4 weeks) purchased and stowed, engines checked, and finally today, sails rigged. 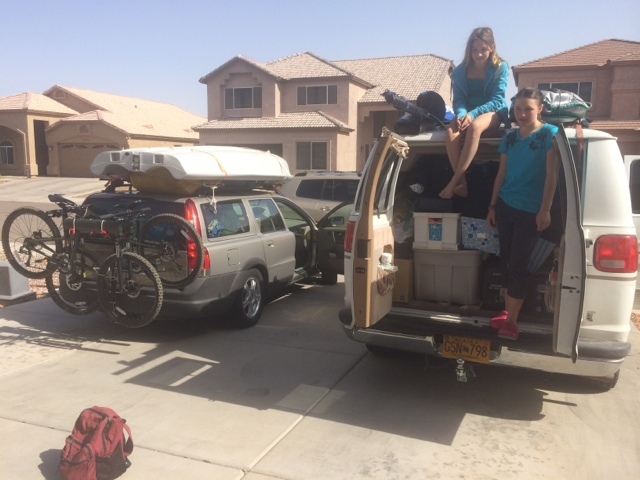 We will leave from San Carlos Sonora Mexico tomorrow morning, make it to the tip of Baja near Cabo around Thursday, then wait for a weather window to cross to Hawaii (about 3-4 weeks). Track Us on our MapShare page https://share.delorme.com/JenniferGordon and here. Just to clarify, I know I'm going on a grand adventure across an ocean for a month with some friends that i met when I was cruising for 13 months and going from Alaska down to the end of Mexico. But why didn't I write abut it Because I honestly don't choose what I write. that last post, it was sopposed to be about eggs in a nest with a momma sitting on them in the back yard of the house we're renting while we prepare The boat to go in the water to go on a grand adventure across an ocean for a month with some friends that i met when I was cruising for 13 months and going from Alaska down to the end of Mexico. But instead, it was an inspiring piece about writing your own story and blank-page-people. I don't write with my hands. I believe with all my heart and soal. I hate blank pages. But when I see one I cant help feeling ba for it. You might say that they're jst waiting to be filled, but what if there was a forgotten little paper. Growing old and coated in dust. Then finally being found with this newfound hope trys to glow whiter. I must be irisistable! it thinks. I'll finally have a story to tell! But, alas, the victory is short-lived and it getts balled up in the trash. So whenever I see a blank page I cant help but write or draw or give it it's own story to tell. I think everything should have it's own story. Don't you? Don't you want to fill those little papers' hearts with hope and joy and adventure? I know I do. But what ifthere were blank-page-people? No- not what if- where are. I think that everyone is born a blank page. We're just waiting for something to give us a story to tell. How would you feel if you were that old paper, forgotten in a corner. Destined to end up in a ball in the trash. I thik no one should be that dust coated blank page. everyone should have a story to tell. Just because you're down does not mean you dont have a story to tell. So keep on telling you're story, little page. And if you ever have doubt, believe in your self. Because you are just as capable, just as strong as the person sitting next to you. So be your own person and tell the world your story. Those of you who know me well know that I get a sort of sick thrill out of planning adventures, that I somehow create complicated logistics for any outing or event, from a simple night out to weeks-long vacations. I change the plans numerous times before the event actually occurs. I rattle on and on about possibilities and options. It is part of my process, and many of you know better than to take any of it to heart until the time of the activity is very close at hand. I sometimes wonder how you can stand to be around me while I am doing this. And then I wonder how I can stand to be in my own head during these manic episodes of planning. I've been worrying about all of these things while also trying to figure out what to do with Northern Passage, our sailboat that is here in San Carlos, Mexico. How and when will I get her out of the water without Bruce? What needs to be done to put her to bed properly? Can I do it myself? Two days ago I melted. I hadn't been sleeping well, and that day I could do nothing productive. I had a headache all day. I shut down. In the end, I finally let go of control. I stopped fretting and wondering, I stopped over-analyzing and trying to know what was coming next. I gave in to not knowing. And I slept. After a series of loving, encouraging and centering texts from Bruce and about 9 hours of sleep, I awoke happy, productive, relieved. Capable of doing anything! Including proceeding with confidence while still not knowing all of the answers. Many of those decisions I had been fretting about seemed to resolve themselves during my unconscious state. Or they became less urgent. This journey has not even officially begun, however I think I am changing already. And if this is what happens during the logistics part of the adventure, imagine what will happen during the actual voyage! Bring it on!! Meanwhile, I will be sure to have happy feet in the sand, even if only for a few minutes a day. Because for me, clarity happens not in the time when I am looking for or working on a solution, but in the silence of time spent in nature, in the sound of the waves, in the peaceful rocking of the boat during sleep, in the space between the thoughts. Here we go, driving to Mexico today. All packed up with 6 weeks worth of food, gear and toys (laser Pico sailboat, surf boards, bicycles, fishing poles, art supplies and many many devices). For six people! We will most likely make one more trip up to Arizona for last minute odds and ends. I suppose it depends how you look at it. In the eyes of a mother or a father, it would seem like the child (or children) are the sun of their universe. But in the eyes of a child, the mother and father would definitely be the sun. We gravitate toward it. That yin-yang swirl of light that we see by. We gravitate toward it when needing food or warmth. As I wrote in a poem once, "My moher is like the sun, sometimes shining with a calming grace, and other times scorching the world with her blinding fury." A family is a universe, and just as no universe is the same, no family is very alike. I am lucky enough to have a yin-yang sun that cancles it's self out perfectly. My mother is demanding, pushing, and angry, yet fiercely loyal and brave for all that she loves. But my father is more the calm and quiet type, he is a gentle giant; intimidating until you get to know him. Then he is like the song of a dove in the morning. My brother and I are two diffrent planets, but we manage to live in the same space, among the same stars. We orbit our parents in a line so similar and close, it is almost like we are one. But no solar system can be perfect. And every once in a while one of us accidentaly wobbles too far out of our ring and clashes with the other, and we are thrown apart, but the families' gravity always pulls us back into line. And we maintain a nearly smooth course. My family means the world to me. My family creates my universe, a calm place to rest in a swrling ocean of rip-tides and rogue waves. My home. My life. My soul. Me. 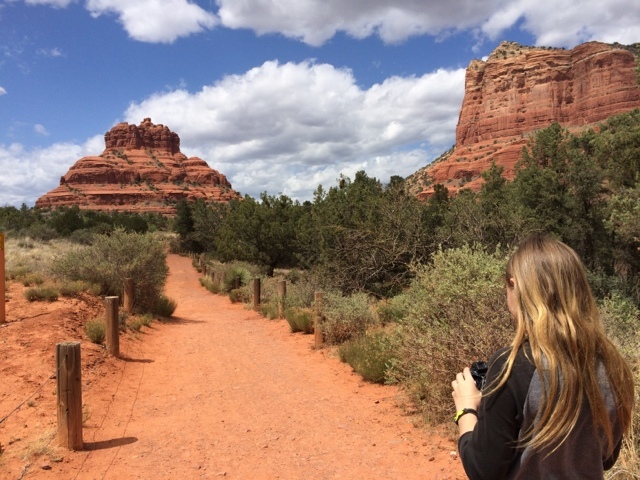 Carmen and I spent two days soaking up the energy in Sedona, where an ancient sea's spires rise upward in red rock magnificence, where the peaceful desert with agave and cactus meets oak creek canyon at about 4,500 feet with burbling creek water sliding over smooth rocks among towering pines, oak, aspen, maple. We left this place full. Content. The beginning of our new relationship taking root. Perhaps the magic of the "vortex" entered us. Or perhaps we found our own magic in the stillness, in the blues and reds and greens. In the warmth and sunlight. 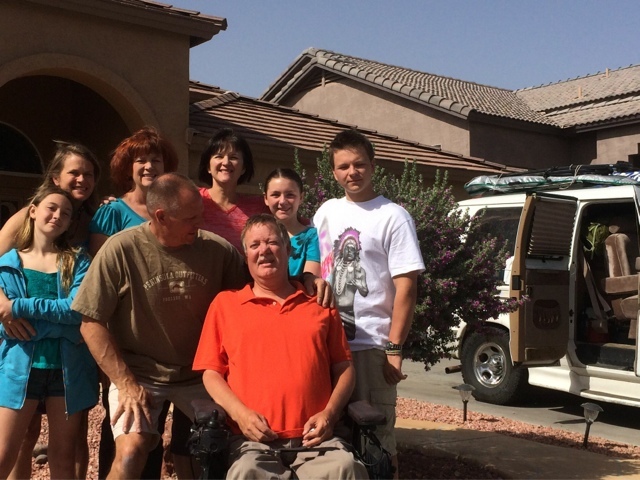 Today we arrived in Phoenix with a hug from Jim saying "the crew has arrived!" Carmen and Nikki jumped right back into best friend togetherness, talking and laughing and splashing in the pool as if no time had passed. Colton razzing them in that big brother sort of way. Richard was a palpable missing part if this four person gang. And in a funny way, I felt at home. With Gina and Jim and their family. During dinner we reminisced about Mexocan sailing stories, laughed a whole lot about flipping dinghies at Tenacatita. And I realized why we are here. To share and to help. To sail and to travel. To make memories and deepen friendships. Tomorrow will be a day of shopping and provisioning, and by Thursday night we should be in Mexico. Sleeping on the beach or aboard Northern Passage. The second leg of our journey completed. Two more legs to go. The river that lived. That's what it felt like. 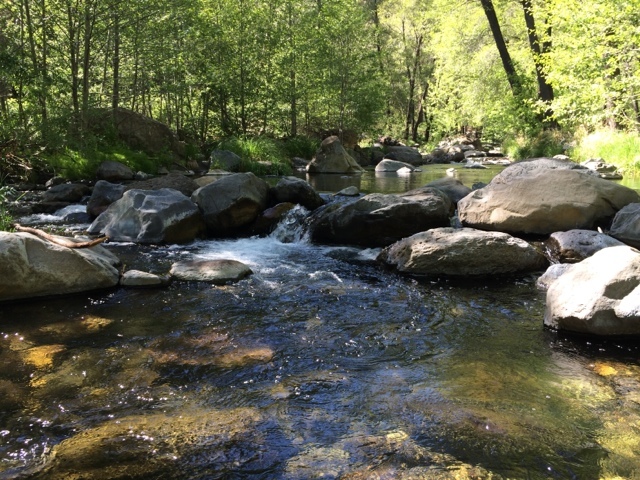 At times it was a gushing current, at others it was a soft, flowing mirror pool of simplicity. I explored further up river by skipping. Or hopping. Or jumping. Or simply letting myslf fall across the gap between stones that poked up from the water like the warm backs of turtles. Turtlestones -no- more like turtlerocks or turtleboulders. Or maybe turtlesteppingstones? Menono... turtlestones works. I'd crouch down and extend my leg from the turtleboulder that i was on to the small turtlestone that would take me one stone closer to... well, my destination, wherever that was. Mom was there, and it wouldn't have been half the experiance it was without her. Her calming presence and willingness to go wherever it was that I was going was... typical. I know that whichever road I choose, my Mother will be there, my trusty steed forevermore wether I like it or not. This feels so wrong... Richard should be here, egging me on. Dad should be there, teasing me and mom. But instead there's just this nothingness. This terrible silence. Peace? No. Couldn't be. too troubling... like calm before a storm. I had a total meltdown yesterday. And i don't even know why. I remember thinking, "I feel like i'm living in a nightmare." I think I was missing dad. And Richard. I don't like this peace of mind. I don't like that hole. Yes, hole. I feel like there's a tear in the energy. I'm usually not really spiritual or anything, but I can literally feel the absance. There's no pretending-to-be-contained laughter when I fall (for a joke or for real) and there's no massive hand helping me up. There's no brother to blame. But there is beauty in it too. I've never particularly liked deserts, but it was very fun hiking, and I enjoyed myself a lot. The rarity of it makes grass seem even more enchanting. It reminds me of dad. The pool is cool and calming, and i guess i don't mind the absence of a constant stream of abuse flowing from my brother's mouth. I still miss dad, but we get to talk on the phone whenever we want until we're in Mx. I guess you could say I've got it made, as i said in a letter once, going away for a month? That's the kind of stuff i dream about! I can't wait to reclaim my passage to now. 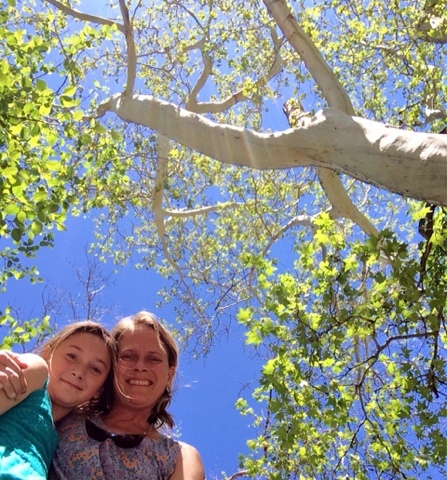 A Mother/Daughter Adventure to Beat All Adventures! Tomorrow morning Carmen and I are venturing out. On our own. A mother/daughter team embarking on an adventure that will take us via plane, car, and sailboat to places we've been and also to places we've never been. 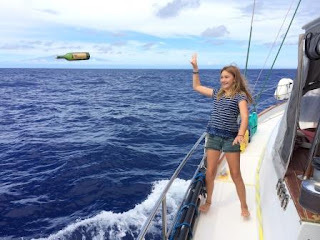 We are helping friends of ours aboard the Sailing Vessel Sweet Dreams sail across the Pacific Ocean (well, part of the Pacific Ocean) from San Carlos, Sonora, Mexico to the Marquesas and Tahiti in French Polynesia. Here is a link to a google map describing our general destinations and itinerary. As we prepare for this, I am buzzing with excitement. For the past seventeen years I have been lucky to share my life with Bruce, my soulmate, my partner in crime, the father of my children, my captain. We met while living aboard sailboats in Jersey City, New Jersey, and have since logged many thousands of miles (over 15,000 I think) sailing together all over the west coast of the U.S., Alaska, and Canada. While sailing, we go together like peas and carrots (as Forrest Gump would say). Aside from about 19 years ago when I delivered my sailboat from New York City to Boston, this is the first time I've ventured onto the sea in a large sailboat for an extended amount of time without Bruce at my side. And it is also the first time I've sailed across an ocean, where we will be traveling for 3-4 weeks without stepping foot on land (the longest I've done this in the past was about 3 days when crossing the Gulf of Alaska and the Pacific Ocean heading to Acapulco). Those times, Bruce was there with me. This journey, therefore, feels different. It has been a long time since I've embarked on an adventure on my own into unknown territory. Perhaps the last time was 14 years ago when I went through pregnancy and delivered my first baby. What a mind-opening and mind-blowing experience THAT was!! I am hoping this will be another one of those. My husband loves that Carmen and I are doing this. 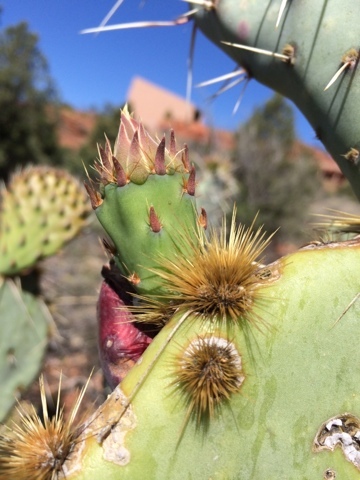 He sees it as an opportunity that may not come again, at a time in our lives (Carmen on the bring of puberty and me just beginning the menopausal journey) when we are beginning to change. He said in an email recently, "look at the white boat as your red tent." We are a family of four from Anchorage, Alaska. We spend most of our free time recreating outdoors in the Alaskan wilderness and Anchorage city trails - skiing, biking, hiking, and boating. We have lived aboard our 51-foot sailboat Northern Passage and sailed from Alaska to southern Pacific Mexico. Bruce and I met in 1997 while living aboard our own sailboats in Jersey City, NJ. 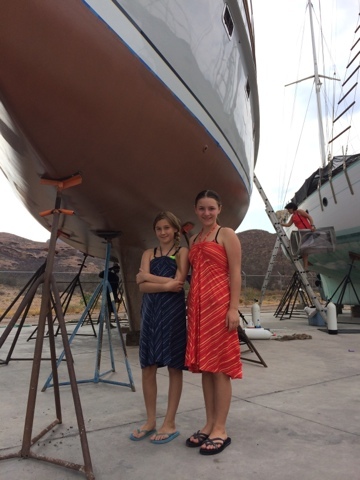 We have raised our children aboard and around sailboats, and now that they are 15 and 13 years old, they have developed their own passion for sailing. This blog is intended to be a place where all four of us will write about our sailing and adventuring experiences. Enjoy! All content copyright of Jennifer Lee Gordon. Travel theme. Powered by Blogger.